During his Macworld Expo keynote address on Tuesday morning, Apple CEO Steve Jobs introduced the MacBook Air, a computer that the company billed as the world’s thinnest notebook — small enough to fit inside an interoffice mailing envelope. It’s priced starting at $1,799 and will be available within two weeks. Sporting a silvery finish, the MacBook Air features a 13.3-inch LED-backlit widescreen display that has a 1280 x 800 pixel resolution. The backlighting saves power and provides “instant on” response from the moment you turn it on, according to Jobs. The device has a slightly wedge-shaped profile. It weighs about 3 pounds, and sports a thickness of 0.16-0.76 inches. It’s 12.8 inches wide and 8.95 inches deep. 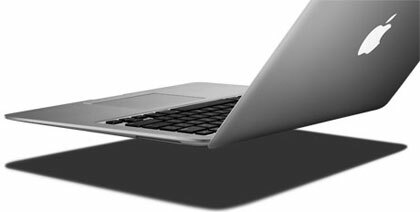 The MacBook Air also features a built-in iSight webcam and a full sized MacBook-style black keyboard. The keyboard is backlit, similar to MacBook Pros, and has an ambient light sensor that automatically adjusts brightness. The trackpad is also capable of recognizing multi-touch gestures, similar to using an iPhone or iPod touch. 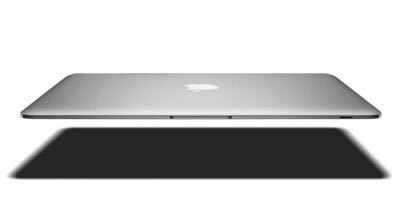 As a result, the MacBook Air’s trackpad is disproportionately large, compared to the size of trackpads found on the MacBook or MacBook Pro. 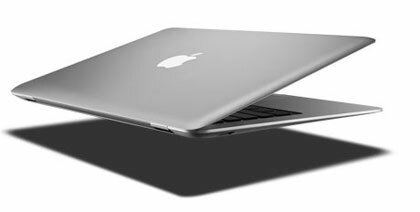 The MacBook Air features a 1.8-inch hard disk drive with 80GB of storage capacity standard. A 64GB solid-state disk (SSD) drive is an option. The hard drive is a Parallel ATA (PATA) model that operates at 4200 RPM. The laptop is powered by an Intel Core 2 Duo chip running at 1.6GHz, with 1.8GHz available as an option. Jobs noted that Intel was willing to engineer a new version of the Core 2 Duo specifically to Apple’s specifications — it’s 60 percent smaller than others. The chip operates with 4MB of on-chip shared L2 cache running at full processor speed, and uses an 800MHz frontside bus. 2GB of 667MH DDR2 SDRAM is also included. I like this laptop it also has good features but the problem is that this laptop is very costly in India.